I went to the house of flapjackery last weekend. I'm generally not a fan of breakfast, but my eating has been a little bit out of whack lately, so I figured why the heck not? (BTW - that's my motto for 2010 - why the heck not? that should lead me on some exciting adventures!) It was breakfast time. I was hungry. And I'd never been there before. I was uber delighted to see pumpkin pancakes on the menu. (Remember my love of all things pumpkin that I blabbed about in early fall?) They're surprisingly hard to find. At least at most chain-type restaurants. I decided to order them without the dollops of whipped cream that are supposed to be served with them, but I still think they were a thing of glory. Yes, folks, they tasted as good as they look. I could have polished off the whole plate...but I restrained myself. The subtle pumpkin-y flavor got better with every bite. 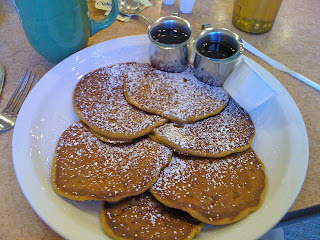 I liked these pancakes so much, I might just go back again before the holidays. Considering that I've been a breakfast-phobe for so long, that's a strong statement coming from me. But these pancakes were just THAT good! What's your favorite Cleveland breakfast spot?